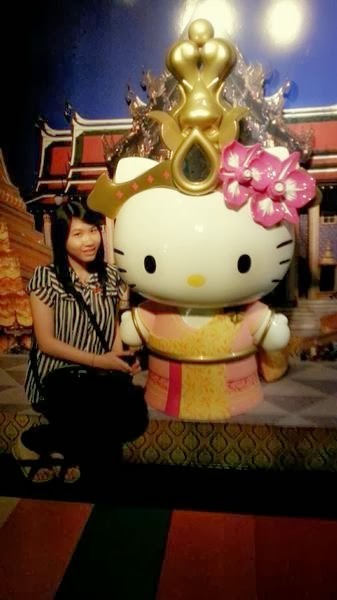 12th January~ Travel all around Bangkok in 1 day! We started our morning by having american breakfast at the hotel's restaurant. My hotel is the tallest hotel in Bangkok, it has almost 90 floors. The restaurant for breakfast is located on 78th floor. I didn't took any pictures of the foods but of course I need to take selca, at least 1 hehehehe. After breakfast, we went to Grand Palace. This is the palace of the king of Thailand. Thailand people love their king very much. There are many flags and king's picture all over Thailand. 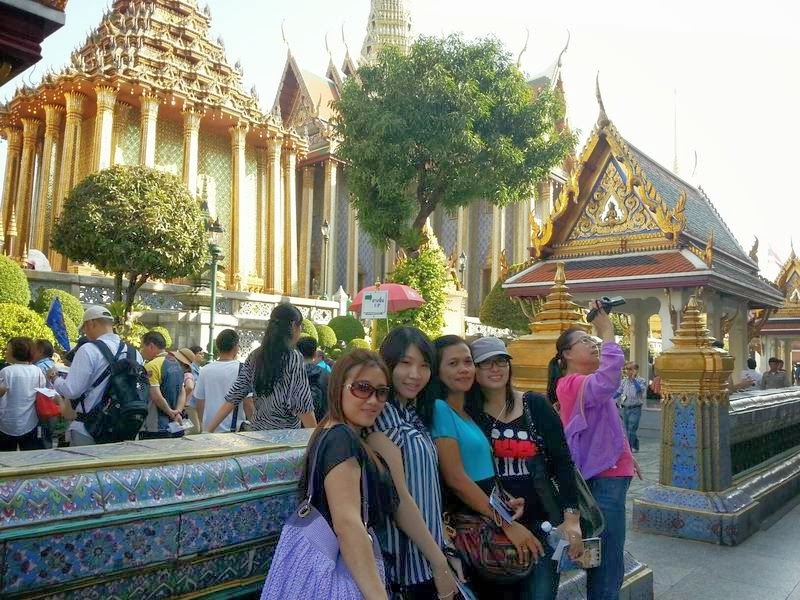 The grand palace is quite corwded at that time, so it's quite difficult to take a good picture without being photobombed by the other tourists hehehe. Next, we visit the sleeping buddha. It is a very longgggg buddha statue that lay his head on his hand. It made from gold (I'm not sure if the whole statue is from gold, but it sure contains gold). I visited this place before when I was kid, but I don't really remember it. So, it's really good to back again to this place. We need to took off our shoes to enter this place. Now let's get some wind~ We rode small boat to cross Chaopraya river and visit Wat Arun temple and traditional market. 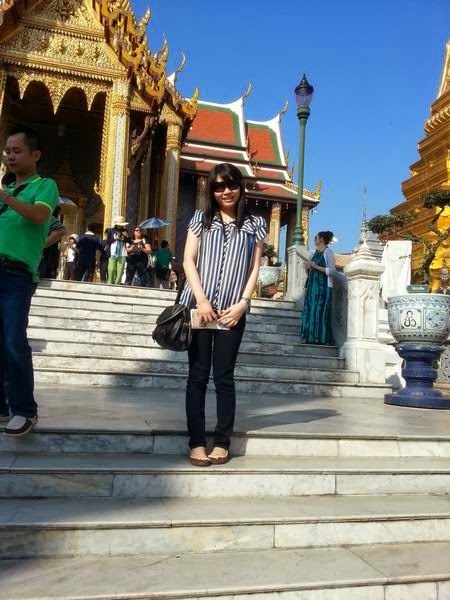 The weather were so hot at that time so I don't took any picture at Wat Arun. Well, I prefer shopping than taking a picture wkwkwk. Next Destination~ MBK! the famous mall at Bangkok. But I'm quite disappointed because I didn't found anything interesting here :( I thought I will bought a lot from here but ended only bought 1 bag. *sigh* I wish we had more time to visited platinum mall. Btw, saw a small group of demonstrans outside the MBK mall. It is very well organize and very different with demonstrants in Indonesia. Then the most interesting part~ Madame Tussauds Museum. I visited the same museum at Hongkong, but the figure inside the museum is different with this one. So took more pictures here again~ hehehehe. 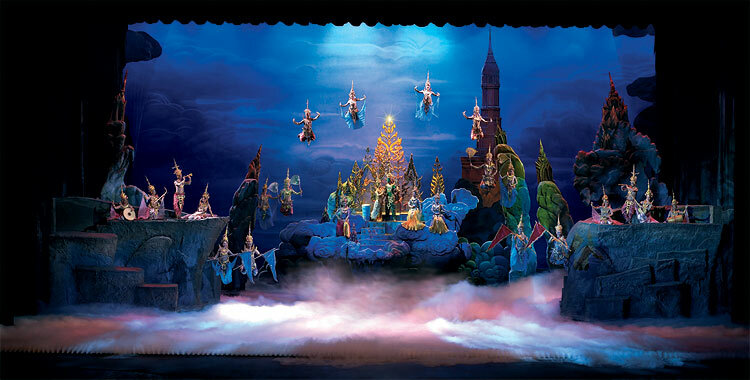 Lastly~ To end this day, We visited Siam Niramit to had dinner and watch the traditional dance show. I really really amazed with the show. All the choreography, stage, and the dancer are very amazing. They even made a real river on the stage. super wow. Too bad we can't took pictures here. Here are few pictures that I got from our beloved google. iya ce menyesal ga mampir platinum next time la ke BKK lagi wkwkwkw *ngarep* haruse aman kok ce walaupun ada demo2 gitu..ga mengganggu turis cm ya ada beberapa jalan yg ditutup gitu tok.. semoga cepet selesai lah demonya.